I woke up at 5 AM this morning and headed to the gym to attempt to get in a good work out before my workday. I hopped on the treadmill with no goals in mind as far as distance. Yes, I’m training for a 5K that’s happening in a few weeks, but I had a double workout yesterday and my legs were shot! I completed the intervals that I did yesterday morning til around the 1.6 mile mark. I was getting really bored and really fatigued. This is when the Hot Mess workout began! ~15 minutes on the treadmill doing intervals! Yup, this was me this morning. I was sweatin’ like a fool. I had my hair piled on top of my head (it was my best creation at 5 AM). And I can guarantee everyone else in there probably thought I was on crack the way I was running all over the place. I obviously could not make up my mind about what to do. Another rushed breakfast this morning, but it was surprisingly delicious and satisfying! I whipped up some oats in the breakroom at work as soon as I arrived. It was classy since I prepared them in a styrofoam cup! I then tossed in some fresh raspberries, added a splash more of soymilk, and stirred it all up. 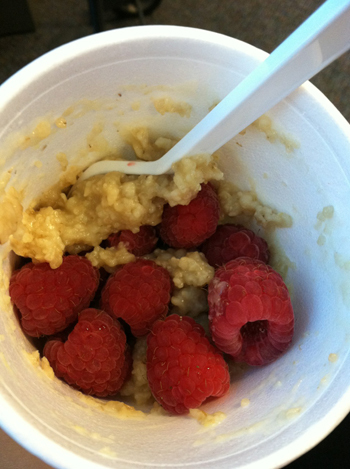 The super hot oats warmed the berries through and it was the perfect consistency. I was very pleased with my breakroom breakfast! I had the remainder of the raspberries and a cup of Greek yogurt on the side. Btw, if you are a Greek yogurt fan, this flavor from Kroger was amazing! 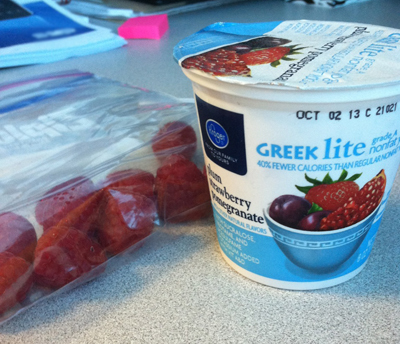 Plus, I’m pretty much obsessed with the Kroger Greek Lite yogurt because it’s only 90 calories, 0 g fat, and 16 g of protein! It’s some powerful stuff and holds over my hungry tummy on most days. I hope your Friday is off to a good start! If you’re one of those lucky people who took an extra day off and are reading this from the comfort of your couch, I hate you! Ok, not really. I wish I were right there with ya though.